You can enjoy the seasonal natural beauty of Ryujin. Ryokan Marui provides you a comfortable space of Japanese-style, having feelings of blending in with the beautiful scenery. Please enjoy your relaxing time while listening to the sounds of a gentle murmur of Hidaka River. A spacious lobby is located next to the entrance. Please have a seat on one of our coaches and enjoy the peaceful experience. The Banquet Hall can accommodate up to 50 people where groups can have parties and meals. 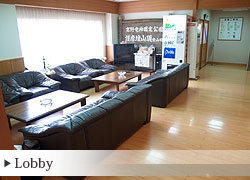 You can also enjoy the beautiful scenery of clear streams on the Hidaka River from one side of the room. This is the dinning room for breakfast. Please enjoy breakfast and start your morning with the morning sun come as it comes through the wide window. 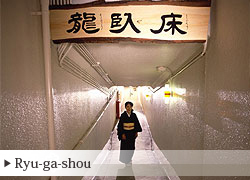 From your room, take this nation wide rarity called the “ryu-ga-shou” under the national highway. 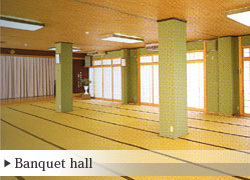 The banquet hall and onsen bath is just beyond. We preserve a traditional Japanese atmosphere and a quiet and spacious place for relaxation. You can enjoy the scenery of Hidaka River and montains of Ryujin from your window. Please have a relaxing time in our guest rooms with the full atmosphere of Japan. 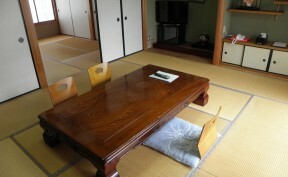 Japanese-style rooms(8 tatami mats) generally are meant for 4 people. 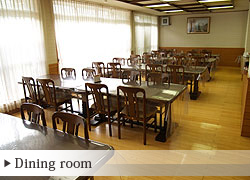 We also have connecting Japanese-style rooms for large groups. There are some beanbags (Otedama) on each room. The beanbags were made by our landlady. 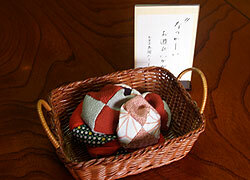 Otedama is a tradional Japanese game which may bring back childhood memories for Japanese people. Would you like to try? 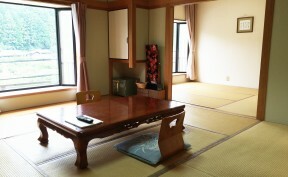 There are two Japanese-style rooms (8 tatami mats and 4.5 tatami mats) in one room with a full bath room. It is located on the 3 floor and has a nice view. 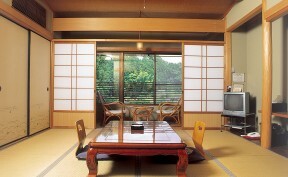 Wide Japanese-style rooms(16 tatami mats) for family and group travelers. Banquet hall, Dinning room, shop, Vending machine. ※　use with a coupon from a travel company is not accepted. Parking, in front of the Ryokan is free of charge.